Researchers from the Rowland Institute at Harvard University and Massachusetts General Hospital (MGH) have utilized a unique nanoprobe devised by the Harvard/Rowland scientists to determine key protein levels in living, cultured cells. 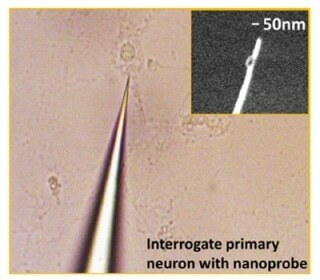 As explained in the Nano Letters journal, the researchers utilized the device to measure levels of Alzheimer's disease realted proteins - amyloid-beta (A-beta) and tau - in neurons and other cells that are exposed to an anesthetic known for creating Alzheimer’s-like changes in the brains of mice. The study findings support the view that the production of A-beta is one of the first steps that lead to the neurodegeneration of Alzheimer’s disease. To study the dynamics of A-beta and tau, we needed a way to trigger the expression of both proteins and a tool to track dynamic changes of protein expression. In 2008, a number of MGH researchers of the present team revealed that the isoflurane anesthetic produced characteristic changes observed in Alzheimer’s disease, including the creation of A-beta and the activation of cell-death enzymes, both in the brains of mice and cultured cells. In 2014, the Harvard/Rowland investigators showed that their nanodevice is capable of measuring intracellular protein levels in living, cultured cells. The present study combines both of these achievements to explore a vital question concerning the Alzheimer’s disease mechanism – whether production of A-beta follows or precedes the production of the abnormal structure of tau proteins that describe the distinctive nature of the disease. The nanodevice’s tip measures about 50 nm (billionths of a meter) across, 200 times smaller in comparison to a single cell. A gold nanorod, included in the device, functions as the biosensor for surface plasmon resonance, which is a resonant oscillation of electrons following a light signal that can produce an optical output mirroring protein binding signals. Different antibodies that target specific proteins can be incorporated into the nanoprobe to provide exact measurements of protein levels. At first, the researchers showed that it can be feasible to utilize the nanoplasmonic fiber tip probe (nFTP) to measure protein levels in single cells without disturbing their capability and vitality. The researchers then used the nFTP device to track the varying levels of A-beta and tau proteins that are characterized by surplus amount of phosphate molecules in living, cultured cells treated with the anesthetic isoflurane. The results pointed out that the rise in A-beta expression preceded the increase in phosphorylated tau levels by several hours. Next, the team revealed that when A-beta expression was blocked the tau levels decreased considerably, but when the same tau levels were blocked they did not reduce the initial rise in A-beta. However, A-beta levels ultimately began to reduce without phosphorylated tau expression, signifying a cycle in which A-beta production activates tau phosphorylation, which in turn stimulates further production of A-beta. We have brought the traditional immunoassay into living cells with exquisite sensitivity. The device is still limited in its ability to measure a large number of single cells, requiring further improvement. But its high-sensitivity, label-free and single-cell capability make it a unique tool for diagnosing clinically obtained limited samples. Zhongcong Xie, MD, PhD, director of the Geriatric Anesthesia Research Unit in the MGH Department of Anesthesia, Critical Care and Pain Medicine and co-corresponding author of the study, adds, “Each year approximately 8.5 million patients with Alzheimer’s disease need anesthesia and surgical care worldwide. Learning how anesthesia affects the mechanisms behind Alzheimer’s will require collaboration among specialists in anesthesia, neurology and engineering. Moreover, this use of both an anesthetic and the nFTP device to measure interactions between A-beta and tau is just a first step.” Xie is a professor of Anesthesia at Harvard Medical School. Other co-authors of the Nano Letters study are Yuanlin Dong, MD and Yiying Zhang, MD, MGH Anesthesia; and Wooyoung Hong, PhD, Harvard Department of Chemistry and Chemical Biology. The study was supported by a Rowland Junior Fellowship award and National Institutes of Health grants R01 GM088801, R01 AG041274 and HD 086977.